Research has shown that people who set goals have a higher likelihood of being successful. Goal-setting creates motivation, and when people set personal goals, their performance and success improve. Setting and achieving goals, no matter how small, elicits positive emotions like joy, pride and a sense of accomplishment. With achievement, we are more motivated to seek bigger, more challenging goals. Plus, the confidence we develop with goal setting helps get rid of negative thinking, doubt and fear. Asking kids to set goals might feel a little stiff and formal. You may feel that kids are subjected to a lot of pressure and structure at school, and want home to be a relief from that, but personal goal-setting is actually a great way to ensure that children make room for pursuing their own interests and achievements. For kids, it’s all about the process, not the product. Helping your kids set goals allows them to develop a sense of pride and commitment to the effort–not just the result. As a parent, you can help your kids by taking their goals and breaking them down into manageable pieces. For example, if you have an older kid who is hoping to make a traveling soccer team in the fall, you can talk about how he or she can achieve that goal: committing to weekly practice time in the backyard (solo or with siblings, friends or mom and dad), joining a team he or she is qualified for in the spring, and summer camps that might help refine their skills. A little kid might look at things more concretely: perhaps building a LEGO set completely on their own for the first time in the upcoming week. You can encourage them to ask for help only after they have puzzled through the directions on their own and are truly stuck. How about mom and dad? Letting the kids in on your goals and how you plan to get there is a great way to give them a glimpse into how this stuff works in the real world, and to open up real discussions about real-world achievements. 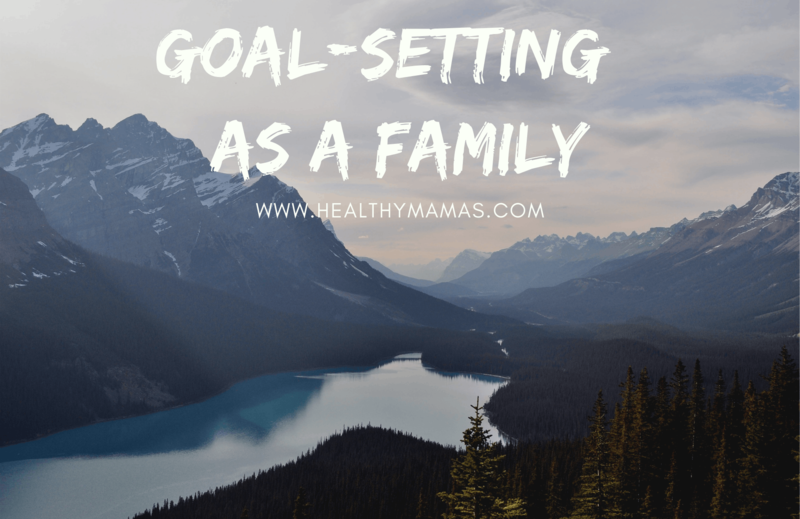 So where do you start when it comes to goal setting as a family? Here are a few tips. New Year’s Resolutions so often fail because they are lofty, vague and unattainable. They also put your deadline a full 12 months away. “Small” is relative–it will mean something different depending on your age, ability level and what you want to achieve–but for kids especially, finding goals that are attainable and can keep their attention are key. This is where things get fun and you have a chance to cheer one another on. By creating a chalkboard, whiteboard or other display like a sticker chart (again, depending on the age makeup of your family), you can create a visual reminder of your goals and your progress to achieving them. It’s important to focus on the process, not the result, so celebrate tracking just as much as you do achieving the goal at the end. Reinforce that it’s not about “winning” or “losing” but about celebrating the milestones and effort put forth. Use dinnertime conversations to talk about where you’re at with your goals and to offer encouragement and suggestions for making strides towards them. Make a weekly “date” to talk about your goals: where you are, new ones you’re setting, challenges you’re facing. It’s a great chance to bond as a family and to understand one another better. Talk about heroes that have achieved these goals in the past–people you know, teachers, athletes, musicians and more. We don’t always meet our goals, but by focusing on the process, we can teach our children the value of setting them and working towards them. If a family member fails to meet a goal, talk about why. Was it too lofty and aggressive for the timeline? Did they lose their sense of purpose? Did another goal take precedent? See it as an opportunity to learn and grow. There’s lots more information about goal setting as a family in Chapter 14 of my forthcoming book, 52 Small Changes for the Family.